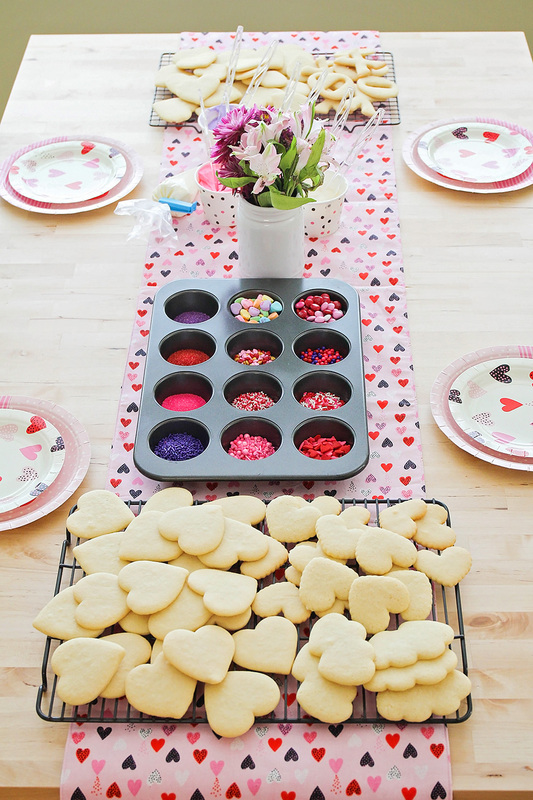 This simple and fun Valentine's Day cookie party is the perfect way to make some sweet memories with your little ones! Happy Valentine's Day everyone! 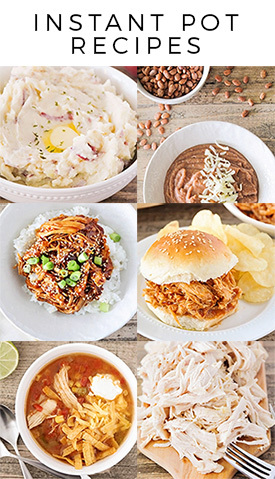 My favorite day of the year is finally here! 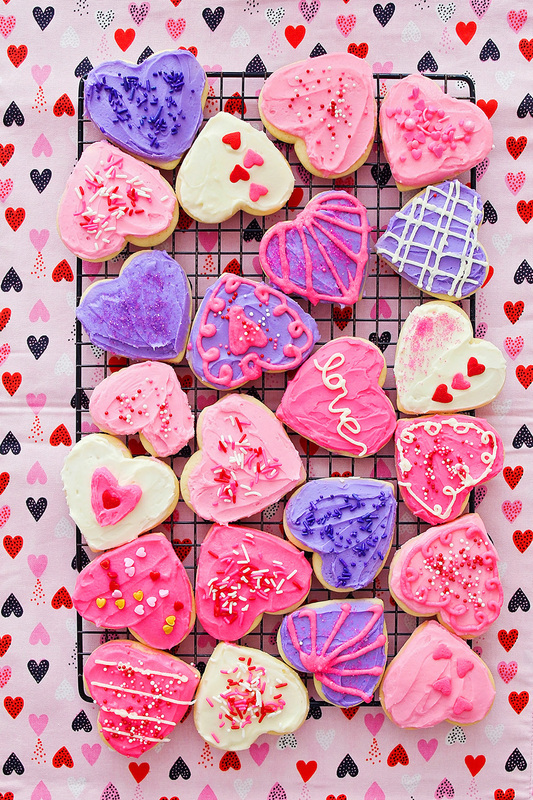 Ever since I was little, I have been totally obsessed with Valentine's Day, and today (at almost 35) I still get giddy over all things pink and heart shaped. Usually we celebrate with a fun family breakfast (you can see last year's breakfast and get a tasty muffin recipe here), and I leave little surprises on each person's plate. 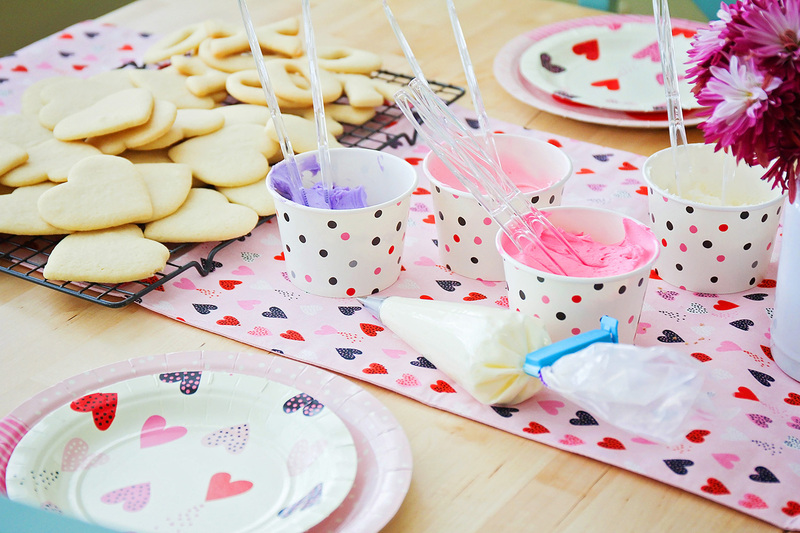 This year, we'll have to wait until Sunday for our traditional breakfast, due to my husband's work schedule, but I thought it would be fun to have a cookie decorating party with my kids and their friends to get us all in the Valentine's Day spirit. The kids had a blast! I'm always a little surprised at how little it takes to blow their minds. 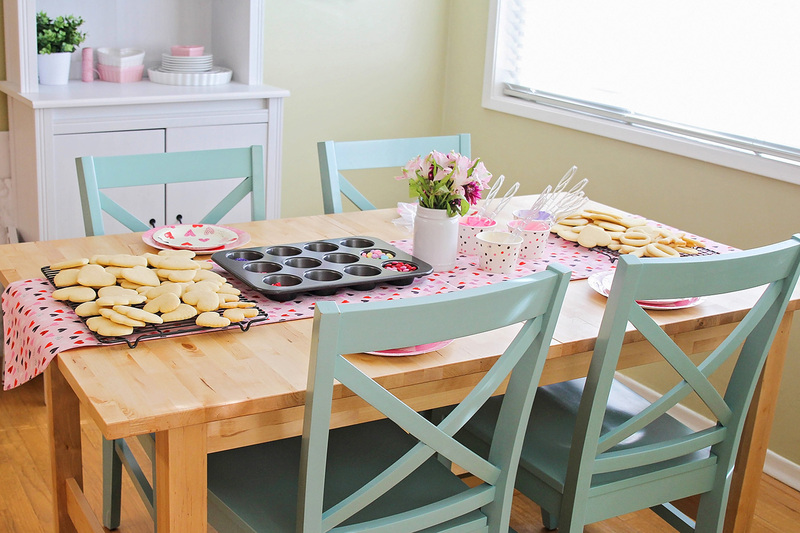 I bought a cute valentine table runner from Target, added some fresh flowers, and baked up a double batch of my famous sugar cookies (recipe below). My kids were so excited to see the cute table spread! I finally wised up and used disposable bowls for the frosting this time, and it was definitely the way to go! I liked that I could just toss them when we were done decorating, instead of trying to scrape out all the extra frosting. We also used plastic utensils and paper plates to keep things easy peasy. 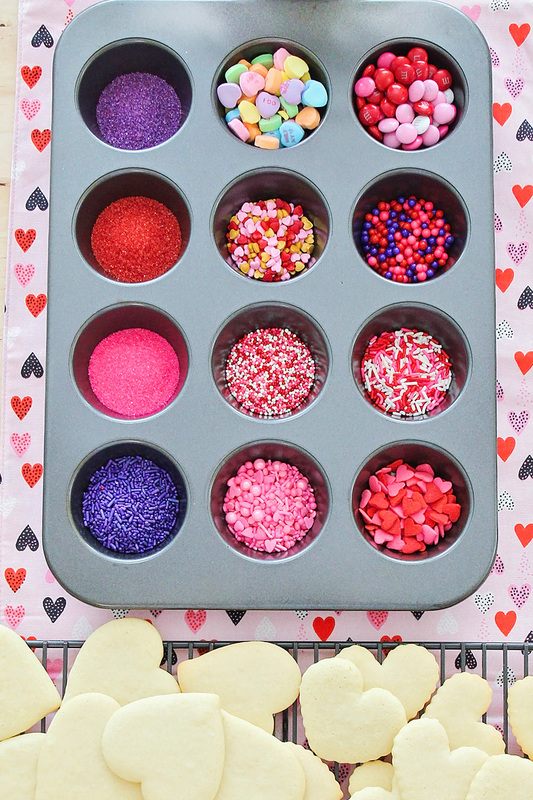 I pulled out my favorite cookie decorating trick again, and added all the sprinkles to a muffin tin to make them easy for little hands to grab. 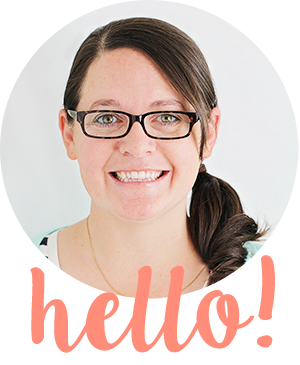 It cuts way down on the mess, and ensures that my six year old doesn't dump an entire bottle of sprinkles on one cookie (which has unfortunately happened countless times in the past). It's a bit of a pain to put the sprinkles back into their bottles (I usually just use a small funnel, or make a funnel out of a small piece of paper), but it makes the overall clean up way faster! I got all of my sprinkles from Target, except the purple jimmies in the bottom left corner, which are from Gygi. How fun does this table look? My kids and their friends were excited to get started! Everyone had such a great time, and it was so fun to watch each of them being creative and trying new ideas. 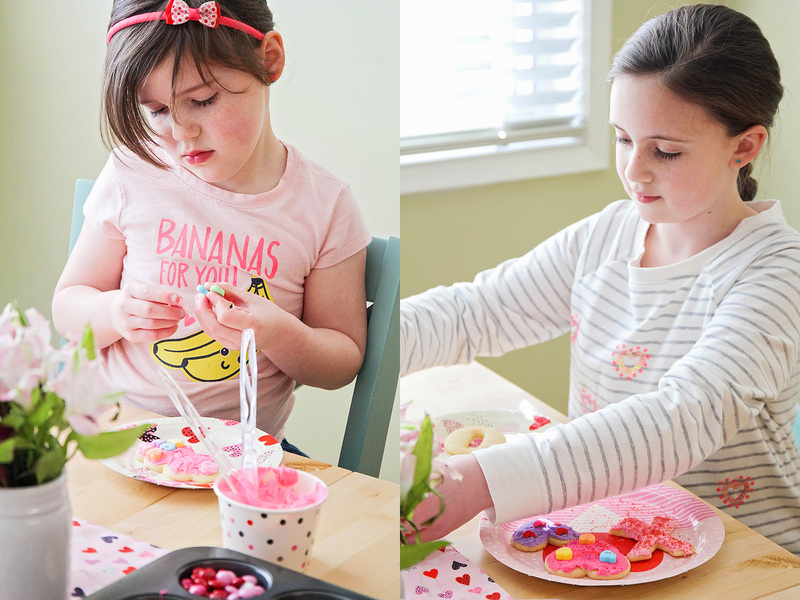 I thought I would see a lot more furtive stealing (and eating) of sprinkles and frosting, but they really had their eyes on the prize and were concentrating on making cookie masterpieces. 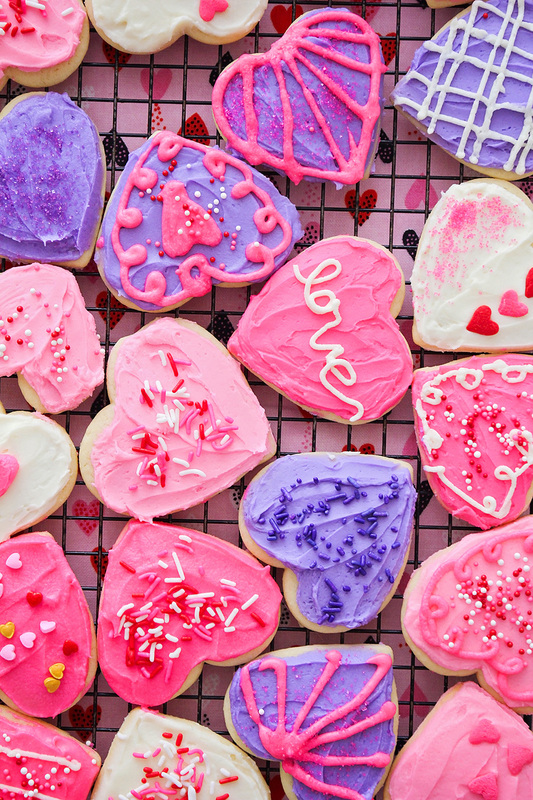 I decorated some cookies of my own with the kids, and they turned out so cute. Valentine's colors are definitely the best! We used my very favorite never-fail sugar cookie recipe (the same one I've been using since I was a child and first learned to bake cookies), and it was perfect as always. These cookies are always a hit! In a large bowl or the bowl of a stand mixer, beat together the butter and sugar, until light and fluffy. Add the eggs and almond extract, and beat until smooth. Add the flour, baking powder, and salt, and mix to combine. Wrap the dough in plastic wrap and refrigerate one hour. After the dough has chilled, roll it out on a flour-dusted surface to 1/4 inch thick. Cut with cookie cutters and place on a parchment lined or greased baking sheet. Bake 8-10 minutes, or until the cookies are just slightly golden around the bottom. Remove to a cooling rack and let cool completely. To make the frosting, beat together the butter and powdered sugar. Add the almond extract, and enough half and half to make the frosting come together. Beat the frosting on high for 3-4 minutes, until light and fluffy. Separate into bowls and add food coloring to make different frosting colors. Decorate as desired.